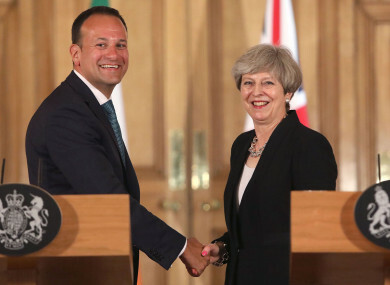 UK Prime Minister Theresa May with Taoiseach Leo Varadkar. BREXIT TALKS ARE proceeding on to the next stage, and despite progress moving at a snail’s pace, the reality that Ireland is losing a close ally dawned on Taoiseach Leo Varadkar this morning. In Brussels this morning, Taoiseach Leo Varadkar somberly acknowledged that Ireland will miss their support on key issues. I have to say that once again I am going to miss the United Kingdom when they leave the European Union. Varadkar said Theresa May intervened on a proposal from the French president Emmanuel Macron on taxing hi-tech companies at EU level. The Irish government has previously said it opposes any such changes, obviously due to the high number of tech companies based here. The Taoiseach said the UK are on the same page as Ireland when it comes to taxing digital revenues and tech companies. She made some very strong interventions on digital tax and digital Europe which are very much in line with our thinking. We were successful in writing into the conclusions the concept that any change to the taxation of digital companies should be done on a global basis. That we have to have a global level playing field using the OECD. And we shouldn’t being in a tax proposal in the EU that just disadvantages ourselves in relation to the third countries. But once the UK close the door on the EU, Ireland could find itself isolated. Which is why Varadkar’s mini-summit meeting with Scandinavian and Baltic leaders was notable yesterday with the Taoiseach making moves to form new allies. At a working dinner last night, UK Prime Minister Theresa May made a personal appeal to EU leaders for the Brexit talks to move on to the subject of trade – despite EU negotiators previously indicating that specific solutions on EU citizens’ rights and the issue of the border with Northern Ireland must be dealt with first. Again, the Taoiseach welcomed the “positive language” used by May. He said her position had strengthened on the issue of having no physical infrastructure on the border with Northern Ireland. However, he reiterated there now needs to be real solutions as to how this will be achieved. “The sentiment and the language must be backed up with detail,” he said. He denied that we are closer to the cliff edge when it comes to Brexit. I have to say, we are a long way from that. May is in a tight bind at the moment, with EU leaders in Brussels well aware that she is in a precarious political position back home. Reports last night suggested she was making the case that she had to return to Britain and show to her detractors that she had made some sort of progress. Here appeal over dinner last night appeared to pay off. The President of the European Council confirmed today that Brexit talks will proceed to the “second phase”. In a press conference today, she welcomed the movement on the negotiations and said the UK still wants a “deep and special partnership” with the EU after Brexit. “We still have some way to go,” she admitted, but added they are “in touching distance of a deal”. The prime minister mentioned Northern Ireland in her speech, again committing to no physical border, adding that both sides have agreed to deliver this with a “flexible and imaginative approach”. But again, no clear detail as to how this will be achieved. She said the Belfast Agreement must be “at the heart” of their talks, stating that “it is too important” to neglect it. On the issue of the Brexit bill – which has many in the UK concerned – May said she has given reassurances to the current budget plan, stating she will go through it line by line. If there are particular EU projects the UK would like to remain a part of, she said they would cover the costs associated with remaining within them, highlighting such projects in as science and research and justice. Email “Leo: 'I am going to miss the UK when they leave the EU' ”. Feedback on “Leo: 'I am going to miss the UK when they leave the EU' ”.